High Quality Content by WIKIPEDIA articles! 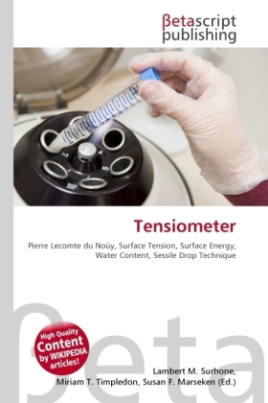 The term tensiometer applies to at least two different devices, one designed to measure the surface tension (scriptstylegamma) of liquids and the other to determine matric water potential (?m) (soil moisture tension) in the vadose zone.A tensiometer for measuring matric water potential consists of a glass or plastic tube with a porous ceramic cup, and is filled with water. The top of the tube has either a built-in vacuum gauge or a rubber cap used with a portable puncture tensiometer instrument, which uses a hypodermic needle to measure the pressure inside the tensiometer. The tensiometer is buried in the soil, and a hand pump is used to pull a partial vacuum.